Plaza de España ("Spain Square") is a large square, and popular tourist destination, located in central Madrid, at the western end of the Gran Vía Street. 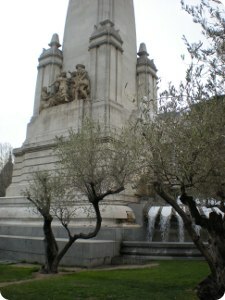 It features a monument to Miguel de Cervantes Saavedra, and is bordered by two of Madrid's most prominent skyscrapers, the first skyscrapers, built in the 1950's: the Madrid Tower and the España Building. Also, the Palacio Real (Royal Palace) is a short walk south from the square. Torre de Madrid ("Madrid Tower") is one of the tallest skyscrapers. It was built in 1957, being an emblematic building for the square and for the city itself. It houses offices and apartaments. 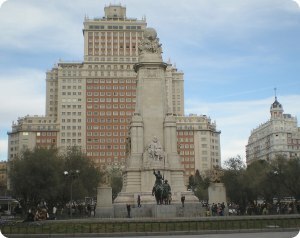 In the center of the square is a monument to Spanish novelist, poet and playwright Miguel de Cervantes Saavedra. Most of the monument was built between 1925 and 1930. The tower portion of the monument includes a stone sculpture of Cervantes, which overlooks bronze sculptures of Don Quixote and Sancho Panza. Around the monument, created a series of landscaped areas for relaxation and enjoyment of pedestrians. The Plaza de España, with great crossroads, with many places of interest around, and a must for any tourist who wants to see bottom Madrid. Princess Street, which goes from Plaza de España to Moncloa, is one of the main shopping streets in the area, as well as Calle Alberto Aguilera. Almost at the beginning of Princess Street, we find the "Palacio de Liria", group of buildings belonging to the House of Alba and has very beautiful gardens. Near of Plaza de España, on Bailen Street, you can visit the Museum Cerralbo (Ventura Rodríguez Street, 17). It presents the Cerralbos family house just as it was left by the Marquis in 1922. Among the collections are The Ecstasy of Saint Francis of Assisi by El Greco, displays of ancient weaponry, and Iberian pottery. A visit to the Cerralbo Museum gives one a peek at what life was like for a wealthy Spaniard aristocrat of the 19th century. A few meters from the museum, another must-see is the Debod Temple, a monument of Egyptian origin who moved to Madrid in 1970. * Lines 3, 10 - Plaza de España station.